We have been thinking of going on a group trip since sometime. RGs wedding couldn’t have been at a better time! Since everyone was meeting up for the wedding, it was easy to extend the vacation. I don’t remember if it took long or short to decide, we finally agreed upon Sri Lanka. On 6th Feb, we left for our 4-day trip to the tear-drop island. We didn’t have any itinerary fixed except for the hotel on 6th night as were landing at 10:00pm. The itinerary developed as the trip progressed. Sri Lankan visa is just a 5 minute process. Fill an online application and you get a confirmation within 10 minutes. Take a printout and that’s it! But well one of us did manage do get even that wrong. Chinta entered wrong passport number on his application and at Immigration when he gave his passport, the officer says “Sorry sir you don’t have a visa” boom! But he is quick to say “Go and see the Chief Immigration Officer and he will help you”! 5 minutes later it was all fine and we were in. Any other country and this would have been a long drawn process. That night we slept at a hotel in Negombo, a beach town about 5 kms from the airport. Next day after picking up Kanika from the airport and some 2 hours of haggling with the taxi guy, we hired an 8-seater for 2 days for Anuradhapura and back. 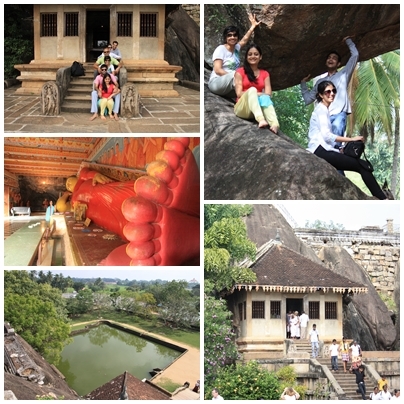 The plan was to see Anuradhapura, Sigriya and then return to Colombo via Kandy and Matale. Well our driver didn’t know English and our driver didn’t know any directions! So our most important expense of this trip was a 800 rupees sim card that we had bought at the airport. Google maps zindabad! We finally reached Anuradhpura at around 8pm (7 hours). Our hotel was nice – Hotel Shalini. From the outside you just see huge walls and a shady sign but inside it was like an old British cottage. We got the 3 oldest rooms of the hotel. That does not mean they were less in anyway… Infact they were the ones with some ‘character’ (Vats would smile at this)! And then followed the first party night. The highlight of the dinner was the Srilankan thali. It’s not called thali but it’s nothing less than what an Indian thali is. The menu would simply say Srilankan rice and chicken curry. But what it means is chicken curry, rice, 5 vegetable dishes, poppadums and chutney. Sri Lankan breakfast was just a little smaller version of dinner spread. It again comes with a number of dishes – daal, iddiappum, sambol, banana and one more curry. After breakfast we left for Anuradhapura sight-seeing. 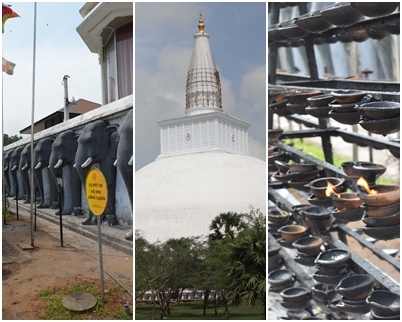 Anuradhapura was the capital for almost a 100 years starting from 380 BC. The most glorious period was around 150 BC when most of the monuments were built. The whole city seems frozen in time. The ancient monuments and dagobas tell the story of how magnificent the city must have been in its prime. 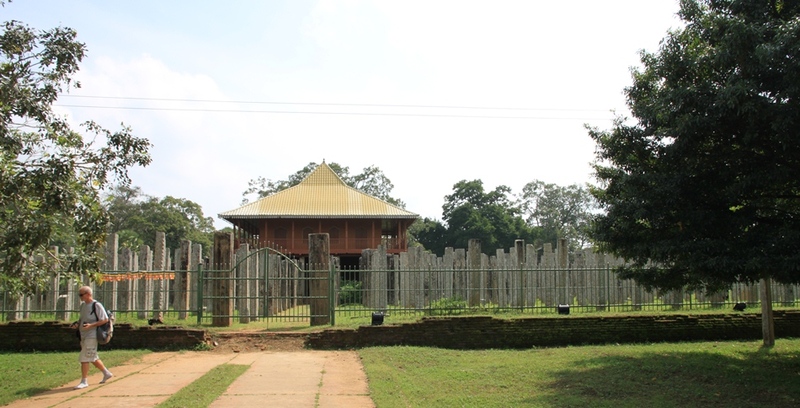 As we walked outside towards Ruvanvelisaya Dagoba, we came across a structure with lots and lots of pillars. On closer look we realized it was the brazen palace. All that remains of the once huge palace, that had nine storeys and accommodated 1000 monks, now are the 1600 columns. In a distance you can see a huge (huge huge) white dome. 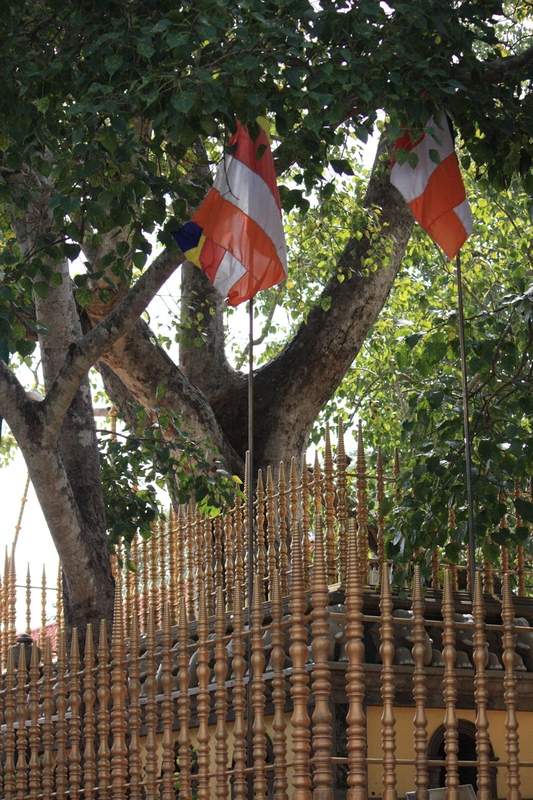 This was the ruvanelisaya dagoba. While the size itself is amazing, I was impressed by the army of elephants that guard the dagoba! The other main sites – the Abhayagiri monastery, citadel and Jetavanarama are all close to each other and you also need just one ticket for all. One needs at least 2 days to do justice to the city, but since we were on a fast track trip, we just drove through those monuments as we wanted to reach Sigiriya in time to go to the fortress. 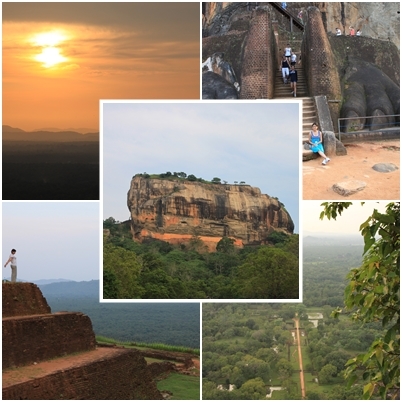 Sigiriya (The Lion Rock) was the one place that I was really looking forward to. I had seen just one picture of the huge rock earlier and I knew I wanted to go there. The ticket is again expensive ($30) but halved for SAARC countries :). It’s not just the rock and the monastery on top of it that is amazing… but the whole package – the vast landscaped gardens, ponds and fountains on the ground, the frescoes inside a cave like gallery in the rock and the monastery on top itself. But more exciting is the climb up. Make sure you make frequent stops in between and take in the whole view from top. At many places the only thing between you and a long fall down is the wrought iron step you are standing on! Makes you wonder how did people actually go up in the 5th century when these steps weren’t there. In Sigriya, we stayed in Ancient Villa hotel. It was a huge property with a lot of greenery and only 5 rooms. In fact we were the only ones making all the noise in the night. The next day we forfeited Kandy and Matale plan because there wasn’t much time and left for Colombo. 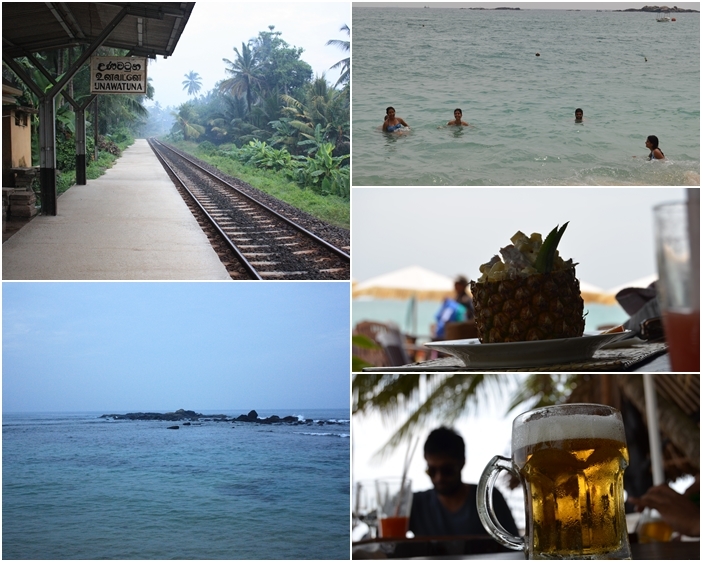 After leaving the taxi at the railway station, we took the train for Galle. The train ride was fun… We didn’t get a seat but made ourselves comfortable at the gates and actually provided entertainment to many with our Dumb Charades. We reached Galle and it started raining. At the station, a tourist agent picked us… we were a big group with lots of luggage and it was raining – a perfect fish for him. But in his defense he was a big help. We didn’t have any hotel bookings for the night. We just knew we wanted to go to Unawatuna. At all other cities we had called in advance and made telephone bookings but here we weren’t able to do so. And just our luck that the place was full. We finally found a hotel with only 2 vacant rooms after almost 2 hours. Unawatuna is a lot like Goa…crescent shaped beach just like Palolem except with warmer and cleaner water. The water is so clear that you can actually see your toes :). So this was the place we would be in for the next 2 days. There are plenty of shacks on the beach and options for a lot of water activities like whale spotting, banana boat, kayaking etc. Unawatuna was badly destroyed during the Tsunami. Every local has a tsunami story and how he re-built his life afterwards. Early morning we left from Unawatuna to Colombo by train and then took a bus from railway station to airport. And then the flight back home. It’s not that Sri Lanka is very different from India, but the fact that it’s not so big, makes it possible to go from landscape to another in a short visit. This tropical gem never ceased to surprise us. 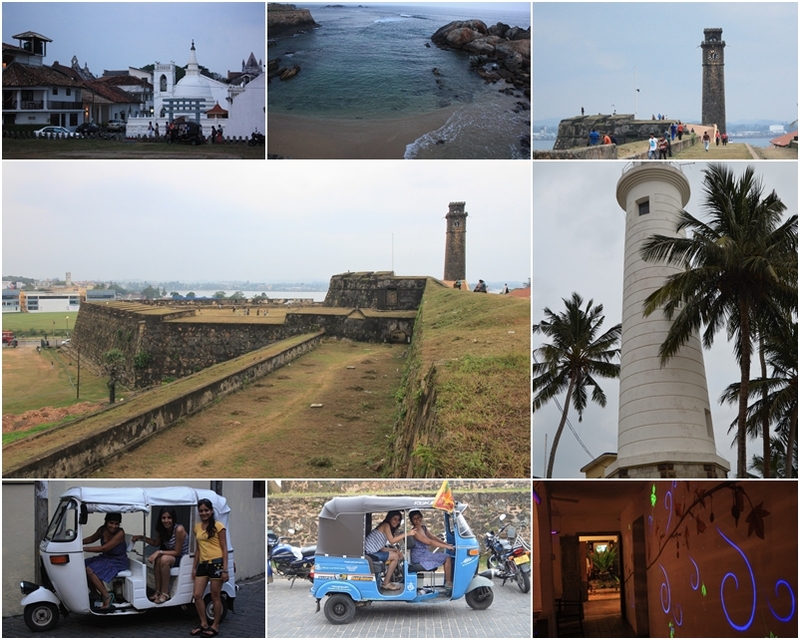 Be it through its ancient cities, mountains, beaches or forts Sri Lanka is rightly the wonder of Asia. Just like temples in most places, you need to wear full clothing at temples and other holy places. No sleeveless or short skirts/ shorts. Feb is supposed to be good climate, but it was sweltering hot. Carry hats, cotton clothing, sunscreen and sun glasses. All the hotels we stayed in had mosquito nets; but carrying a mosquito repellent would be good.